Welcome to the Heffern Lab! 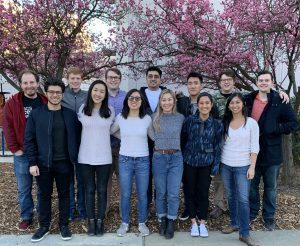 The Heffern lab is a young, growing multidisciplinary team of researchers, seeking to solve problems at the interface of bioinorganic chemistry and hormone biology. Stay tuned to our fun adventures in the lab’s early years! October 1, 2018 Want to know why we care so much about metal/hormone interactions? Check out our latest review article in Metallomics have introduced the term “metalloendocrinology” literature! August 17, 2018 Our UCD LEADS summer student, Kellie (from UC Merced) presented a poster and a talk at the end-of-summer symposium. Great job on your presentations and thank you for joining us this summer! July 31, 2018 The Heffern lab officially turned 1 year old today! Thank you to all who have made this a year of fun, learning, and excitement! June 25, 2018 Marie was featured in the first Early Career Spotlight in the Nature family journal, Communications Biology. Take a look at her interview here. May 19, 2018 Congratulations to Kylie on a job well done with her oral presentation at the LaRock Symposium! See more of our recent news and updates!